This pure vegetarian pizza is made using Daiya mozzarella style shreds and herb Earth Balance buttery spread, so it's not just incredibly tasty — you could fool an omnivore with it. Serve it for your next Friday night dinner and don't mention a thing! It will be gone in a flash and everyone will be floored when you reveal it's pure veg secret. The easy homemade dough requires no rising time, leaving you free to make a quick homemade pizza dinner on the fly. Prepare the herb butter: In a small bowl, blend the softened Earth Balance, garlic powder and basil. Set aside to spread on the pizza crust when it's ready. Make the pizza crust: Preheat oven 425°F. Mix the yeast with the lukewarm water until the yeast is dissolved. Let it stand for a couple minutes, then add the salt and vegetable oil or melted margarine, depending on which you're using and mix. Add the flour and mix again until combined. Roll out the dough to form a thin circle. Place the rolled-out dough on a round pizza tray and put it in the oven for 5 minutes. After 5 minutes, remove the crust from the oven and sprinkle with extra-virgin olive oil. Add the toppings: Spread the prepared herb butter over the baked pizza dough, leaving about 1/2 inch from the outside edge for crust. 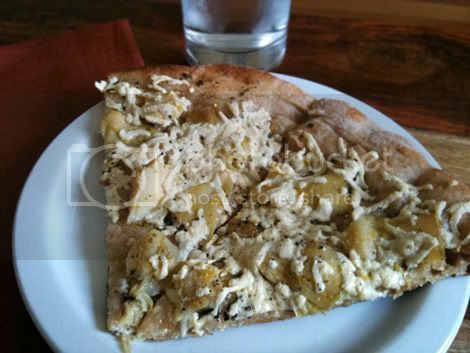 Sprinkle on nutritional yeast, add the artichoke hearts and sprinkle Daiya mozzeralla style shreds over the whole pizza. Top with freshly ground black pepper and bake for 10-15 more minutes, until the crust is golden, toppings are warm and the cheese has melted. Serve immediately.